“To ride in the cab of a Hudson doing 80 miles an hour is the experience of a lifetime,” Roger Weaver said. He should know. He spent 52 years as a railroad man, working for the New York Central’s great passenger steam engines before diesels took over in the late 1950s. Weaver said he quit school in Cincinnati in his junior high school year to become a railroader. 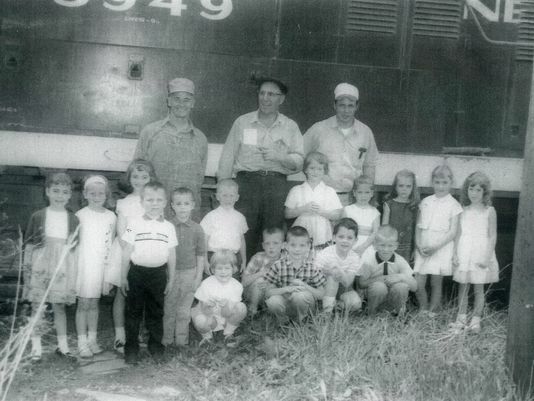 “I loved trains and railroading and couldn’t wait to get started,” he said. By the time he was 17 he was living with his grandparents in New London and gravitated to the New York Central’s Big Four line that connected Cleveland to Columbus, Cincinnati and St. Louis. He worked as a tower operator, a brakeman and a conductor on freight and passenger trains. As a brakeman he often rode in the cabs of the Big Four’s Hudson, Mohawk and Niagara steam engines before the diesel era began. As a temporary tower operator in Vernon Junction, Weaver watched the last Pennsylvania Railroad train cross the Big Four on its way to Toledo. That line is long gone, as are many of the lines Weaver worked. He was a brakeman on a freight train pulling 175 cars across the B&O diamond in Shelby. There was a time, he said, when passenger trains ran south on the B&O from Willard to Newark. Trains in Willard were headed for Chicago in one direction and Baltimore and Washington, D.C. in the other direction. He can remember busy days switching freight cars from Crestline to Shelby; Greenwich to New London and Wellington to Berea on the NYC’s Big Four line. He said the huge yards at Bellefontaine were impressive. “Now they are gone. It’s just all weeds,’’ he said. He spent most of his career working for the Penn Central and then Amtrak. He retired in 2007. Weaver wasn’t aware that there would be a special event this coming weekend at Galion’s Big Four Depot but he may be able to make it. After all, railroads were his life and he hasn’t forgotten.